Anna: First, I wanted to go to Australia for six months but I changed my plans when I saw the pictures and heard stories of a friend of mine. 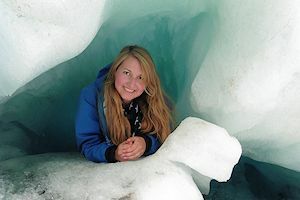 New Zealand has more advantages: it is one of the farthest countries from Germany and its nature is amazing and diverse. You find everything, from high mountains to beautiful beaches. It is like many different countries in one. And the best thing is it is not full of poisonous animals like in Australia. Why did you choose to get the help of a Starter Pack? Anna: This friend also recommended you. We, my friend Katharina and I, had a look at your website and chose to book a starter pack for our trip. We liked the price and the things which are included in the starter package. But I like the most that we were in touch with the team from the beginning. We skyped many times and they could answer all our questions. What was your first impression when you contacted your agency? Anna: My first impression of them was really good. I mentioned before that the team was really nice. They supported us and helped us to organise our trip, for example, they helped us with more complicated things like the paperwork to be done. You also took a 12-month bus pass, was it fun? Anna: Yes, we took a Hop On Hop Off bus pass. We bought it already in Germany because our friend and the agency recommended it. It is really good. You get to know many interesting and nice people. I really like that you can hop on and off whenever you like. I think we hopped off in every city and did not stay long on one bus. It is perfect when you travel alone. If you travel with a friend like us, a car can be better because you can choose more freely where you want to go, but it depends on you. You cannot go wrong with Hop On Hop Off. How would you describe agency’s services? 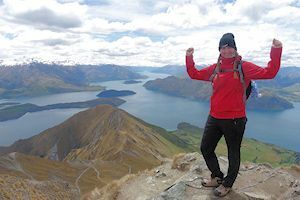 Anna: I would recommend it to every backpacker or person who wants to stay longer in New Zealand. They help you with the important things, like IRD-number, bank account, etc. But it is not only this; we could contact them and ask every question during our entire trip. We never felt alone with our problems. What was the best thing that they did for you? Anna: The best thing is that we could keep in touch with them. When we, for example, needed help to book a ferry or bus, they did it for us. Moreover they said that we can send them a text when we go hiking and when we did not contact them after three days he would send someone to look after us. I really like this, because I know other organisations do not help you at all. What is the best activity that you did in New Zealand? Anna: It is hard to say which activity was the best. I experienced so many amazing things. But I can count two my favorites: the dolphin swimming in Kaikoura and the Ice Explorer in Franz Josef. Anna: My advice would be to be spontaneous. We planned the whole trip at home and we changed it lot. In the end, we did not do anything like we planned. Take your time and do everything you like to do. Do not squeeze in to many things you want to do and see. New Zealand is not so big and you will have enough time. All in all, enjoy this beautiful county with its diverse nature, the nice people, and interesting culture. Anna: The biggest challenge for me was to spend the whole time, 24 hours a day, with my friend. You never spend so much time with a person. We are quite different. I was afraid that we start to annoy each other. We had our difficulties and also some discussions, but at the end I’m happy that I did it with her. I felt never alone and I had someone the whole time I could talk to. But if you are planning to travel alone, you do not need to be afraid as a backpacker you will never be alone. What advice would you give to someone that is about to go to New Zealand with a working holiday visa? 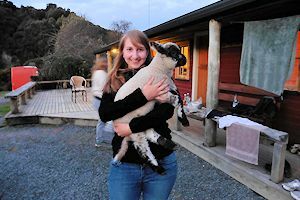 What have you taken away from this experience in New Zealand? Anna: I took many things away from this experience. I improved my English a lot. At the beginning, I was really shy and did not speak much but at the end I could talk to everyone. I became more self-confident and independent. Moreover, I got to know myself better and my boundaries. But the best thing of traveling is getting to know so many interesting and nice people. I got so many friends all over the world. One time maybe I will visit them all. What has been your favourite spot in NZ? Anna: This is hard to say; New Zealand’s landscapes are too different. I have more than one favourite spot. On the one hand, I like Wanaka and Queenstown because of the beautiful mountains and lakes. But one the other hand, Coromandel, with its white sand beaches, is amazing. I think it is not the spot itself which is awesome. It depends more on the people you meet to make a place special. For example, I had a great time in Nelson and Picton. Nelson and Picton are nice spots but not one of the special ones. But I got to know amazing people and I had a great time there. Would you recommend getting a Starter Pack to your friends? 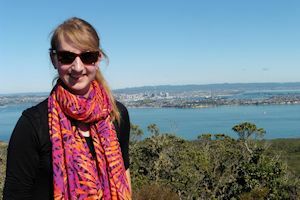 Anna travelled through New Zealand with Katharina.